Arendal ([²ɑːɳ̍ɖɑːl]) is a town and municipality in the county of Aust-Agder, Norway. Arendal belongs to the region of Sørlandet. The offices of UNEP/GRID-Arendal are located in the town of Arendal. The Old Norse form of the name was probably Arnardalr. The first element is the genitive case of ǫrn, 'eagle' and the last element is dalr, meaning 'valley' or 'dale'. The coat-of-arms were granted on 7 November 1924 (based upon an older seal). The arms show a sailing ship as a symbol for the importance of fisheries and sailing to the local economy. A ship appeared on the oldest known seal of the town, dating back to the 17th century. In the late 19th and early 20th century the arms showed the ship in the upper part and a landscape with the coat of arms of Norway in the base of the shield. Arendal was established in the middle of the 16th century, and was then called Arendall. At that time it had no formal town status. When Kristiansand was founded by King Christian IV in 1641, he granted the citizens a monopoly on all trade in Aust-Agder and Vest-Agder. This grant, intended to subsidize Kristiansand and its fortifications, placed existing towns in a difficult position. Both towns and the peasants in the up country protested the hardships this caused. As a result, Arendal received royal permission in 1622 to continue as a loading-place for timber until a means could be found to transfer its trade to Kristiansand. The town was given market city privileges in 1723. However the peasants in the surrounding district, who by law were to sell their goods only at Arendal, were smuggling their goods out on cutters and selling them in Denmark, in the Baltic, and in Britain. This continued until 1735, when Arendal was granted a full town charter. This charter, combined with Danish imposition of a monopoly on grain imports, caused great poverty and starvation among the peasants in the surrounding districts, leading to several famous rebellions. As a result of the rebellions, the age of privileges for towns like Kristiansand and Arendal came to an apparent end in 1768 by royal proclamation. But the problems did not end then; a farmer, Christian Jensen Lofthuus, in Vestre Moland led a rebellion in 1786 which resulted in the government actually remedying some of the most repressive trade policies, but Lofthus died in prison. The charges against Lofthus were that he dealt in grain and other commodities to the detriment to Arendal’s privileges. Shipping, shipbuilding, and timber trade as well as mining and ironworks were important branches of industry in Aust-Agder county for many centuries, especially in the Arendal region. Frequent contacts with the world abroad put their mark on our culture and traditions. In 1880, it was the land's biggest port in terms of tonnage handled. At the end of the 19th century, Arendal was recognized as a major shipping centre with many wealthy shipowners. However, this came to an end following the 1886 Arendal crash, in which Axel Nicolai Herlofson had defrauded many bank customers in the city, leading to bankruptcies and extreme unemployment. Around the turn of the twentieth century, when thousands of Norwegians sought to take advantage of the more stable economic climate of the United States by emigrating, many of those from Arendal took their economic traditions with them. In New York City and the surrounding areas, a great deal of Americans who claim Norwegian Ancestry can trace their roots to Arendal, as a great deal of Norwegian sailors, trimmers, shipbuilders and carpenters from Arendal settled in areas of New York such as Brooklyn, the Staten Island neighborhood of Port Richmond, and several industrial centers in Northern New Jersey such as Jersey City, Bayonne, Perth Amboy and Elizabeth. In 1939, it had the 4th largest Norwegian tanker fleet; only Oslo, Bergen, and Stavanger were larger. During the German invasion of Norway on 9 April 1940, Arendal was captured by the German torpedo boat Greif. Today the town has small boat manufacturing, mechanical industry, electronics industry as well as one of the world's largest silicon carbide refining plants. The town of Arendal was established as a municipality on 1 January 1838 (see formannskapsdistrikt). On 1 January 1875, a small area with 22 inhabitants was transferred from the municipality of Arendal to the neighboring municipality of Austre Moland and another small area with 52 residents was transferred to the neighboring municipality of Øyestad. On 1 January 1902, the rural municipality of Barbu (population: 6,787) was merged into the municipality of Arendal. 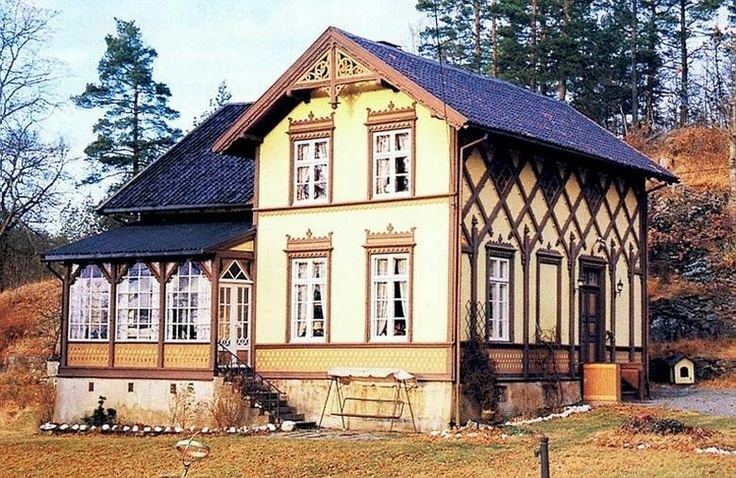 In 1944, a small area of Moland with a population of 21 inhabitants was transferred to Arendal. On 1 January 1992, the neighboring rural municipalities of Hisøy (pop: 4,026), Moland (pop: 8,148), Tromøy (pop: 4,711), and Øyestad (pop: 8,679) were merged into the municipality of Arendal which had a population of 12,478, bringing the total population of the new municipality of Arendal to 38,042. In the middle of the town centre is an area with wooden houses dating back to the 17th century. This area is called Tyholmen, and is what is left of buildings from before the 19th century. The inner harbour of Arendal is Pollen, where the fish market, pubs, and restaurants are located. In the town centre is a large and beautiful church, Trinity Church (Arendal). The lighthouse Store Torungen is located on an island outside Arendal. It was constructed in 1844 and electrified in 1914. It is 34.3 metres (113 ft) high and contains a 2nd order lens. It is reachable by a 55-minute boat trip from the town centre. The lighthouse is still in use. The lighthouse Lille Torungen is situated on a small island outside Arendal. The lighthouse is 28.9 metres (95 ft) high. Lille Torungen and Store Torungen were constructed as twin lighthouses, and both are located in the Arendal shipping lane. Strømsbo gård is a manor house on a historic farm located west of the center of Arendal. The manor dates from the 1760s. From 1804 the manor and farm were owned by members of the Herlofson family. Peter Herlofson took over the farm and gave the building its present form. In 1883, Axel Herlofsen (1845–1910) built the Strømsbo steam sawmill at the head of Strømsbubukt. Nicolai Benjamin Herlofson (1876-1945), former mayor of Arendal, was born and raised at Strømsbo. The city of Arendal has grown from a traditional sleepy summer-town (with culture activities just in the summer) to a more "all year" city. The building of the new library and the combined city hall/concert house has greatly improved culture life. Canal Street is Arendals yearly jazz and bluesfestival during the summer. It has been arranged since 1996, at that time by the name of Arendal Jazz and Blues Festival. The popularity of the arrangement has been steadily increasing. New in 2007 was Hove Festival located on the Island Tromøy just outside Arendal town. It was the largest festival scene in Norway the debut year, and it has an audience capacity of up to 25,000. The municipality is bordered to the southwest by Grimstad, to the northwest by Froland, and to the northeast by Tvedestrand. Arendal is the type locality of the mineral Babingtonite, which was first described from specimens discovered here in 1824. The island of Merdø, an island far from the coast facing the Skagerrak, was a major export port in the 17th and 18th centuries and now has a museum, a kiosk, and several beaches. There is regular boat service from Arendal to the island every day during the summer season. 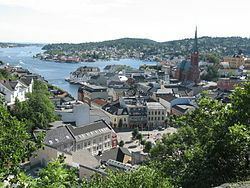 Apart from being a port town, Arendal lies immediately southeast of European route E18. The local railway line Arendalsbanen runs to Nelaug where it connects with the Sørland Line, which runs between the cities of Oslo and Stavanger. Setesdal Bilruter (on behalf of public transit authority AKT) provides bus connections throughout the Arendal area, the Setesdal-region including Froland, as well as to the neighboring towns of Grimstad, Lillesand and Kristiansand, and a handful of their suburbs and outlying villages. A few more destinations can be reached with other bus operators (namely Agder Buss, Nettbuss, Konkurrenten.no and Lavprisekspressen), including Risør, Tvedestrand, Oslo and Stavanger. There is also a bus connection to Kristiansand Airport operated by Agder Flyekspress and Nettbuss express (the latter on behalf of Flybussen.no). Ferries run between the city center and the islands of Hisøy and Tromøy. The town does also have an airport - Arendal Airport, Gullknapp - although it is not served by any airlines. Ronald Frostestad, resident of San Francisco, California, respected health care consultant and manufacturer of Arendal audiophile speakers (d. 2016). The climate here is mild, and generally warm and temperate. Arendal has a significant amount of rainfall during the year. This is true even for the driest month. The climate here is classified as Cfb by the Köppen-Geiger system. 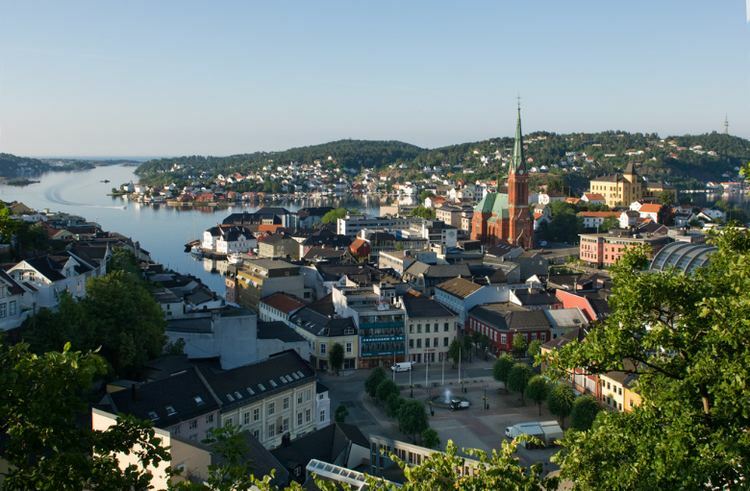 The average annual temperature in Arendal is 7.2 °C. In a year, the average rainfall is 1010 mm.